The following stories describe the personal impact of Huey Long's programs. Please send us your story at stories@hueylong.com. Iam the granddaughter of poor north Louisiana farmers. My dad was able to get a high school education and go on to college because of the free public education made possible by Governor Long. My grandparents lived in a shack and made a meager living on 25 acres, most of which they had to sell by 1940 to survive. The paved roads Governor Long implemented allowed my grandparents to get their crops to market. My grandmother, Sally Ballard, had a faded photo on her dresser when she died. It was one of Governor Long dedicating a hospital. My grandfather's voice still resonates in my mind as I hear him and see him lecturing me on what this world is coming to. There were politicians he absolutely could not stand locally and federally. Mostly, I remember the stories of Huey Long. Governor Long was going to see that families of all socio-economical backgrounds were going to have the equal opportunities. Governor Long was the people's man. The story I remember the most was hearing of Governor Long's death and the thousands of people who attended the services from all over Louisiana. Two of those attending were my grandmother and my great-grandmother. My grandfather saved all of Huey Long's published speeches, which I found in my grandmother's hope chest. Ithink it is relatively unknown to many how severe poverty was in the early 1920s in Louisiana and the lack of basic services that were available to all of its citizens, e.g. schools, roads, bridges, hospitals, health care. Enter Huey P. Long. Gov. and Sen. Long was responsible for so many great things that happened to Louisiana when he was in office. It is remarkable he accomplished so much. He was a genius. Say what you will about his motives, clothes, speaking manner, roots, whatever, this man changed it all in favor of the Louisiana citizen. In my opinion, the criticism he received in the waning years of his life and career was over the top and generated by the wealthy and powerful that feared him. He was not a socialist, nor a fascist as some portray him to be. What he accomplished was within the bounds of a state and federal democracy. When his opponents could not defeat him at the polls or on the floor of the state capitol or the Senate, they verbally maligned him and finally killed him. My dad, A.W. ‘Slick’ Morton, was an orphan from Tallulah by the age of 9 or 10. He later became a star football player at Tallulah High. In 1933, Huey Long got wind of my dad's football prowess and summoned him to his penthouse at the Roosevelt Hotel. Until that trip from Tallulah to New Orleans, my dad had never even seen a paved road. My dad and another good football player, Cy Wickson, were both introduced to Huey — still wearing his pajamas midmorning. Huey commented, ‘Ain't no more good football players goin' to Tulane, they're all goin' to LSU,’ and then he turned to someone else in the room and had my dad and Wickson dropped off in Baton Rouge. Ifirst became familiar with Huey Long by reading T. Harry Williams’ biography. When I enrolled at Harvard College in 1975, I found a shelf, deep in the bowels of Widener Library, that held a dozen books by and about Governor Long. I enjoyed them all. My late dad, Henry Rickerfor, worked for the Recorder of Mortgages for the city of New Orleans during Huey Long's time. In those days, the city administration was at odds with Governor Long. Accordingly, all city employees, well at least those in the Recorder of Mortgages, were charged with going to the homes of New Orleans' residents and "canvassing" for their candidate and against Huey Long. My dad often remarked how useless and frustrating that was. Many residents would not invite them into their homes once they were identified as promoting the opponent of Huey Long. And those who would invite them in always seemed to have a picture of Huey Long on their mantlepiece. My dad said it was an exercise in futility. My husband, Huey D. Ingram, was named after Huey Long. His mother, Ruby Ingram, raised five children as a single woman. Her husband went off one day to hunt for a job and never came back. She worked at odd jobs and gave her children an education while living in Natchitoches, Louisiana. My husband is proud of his name and tells everyone who he is named after. Huey Long died long before I was born, but his name and legacy were an everyday part of my life. My grandfather, Eddie Manuel of Mamou, Louisiana, was a friend of Huey Long and a supporter of every Long to run for office. He told me as long as I can remember, "Always vote for the Long." I was born in my grandmother's shotgun house, which sat on the old Hu Long place in Winnfield, LA. My grandmother was very pro-Long. She had raised two children by herself during the Depression, and she stood firm on her belief that Huey Long had saved many a poor person's life with his various programs. On occasion, especially when Earl pulled some stunt or one of the other Long politicians may have done something she did not agree with, she'd get mad and say something about the Longs. But under no circumstances would she allow anyone else to say anything negative about Huey or Earl Long. My grandmother always said that much of the negative news (media) on Huey came from "carpetbaggers" who came south to profit off the poor folks. And in time, I came to realize that much of what was written about Huey was from people who were not Southern and were from families of wealth. Iwas born in 1933, about the time Huey P. Long was campaigning for the Senate. My parents were poor farmers in Tangipohoa Parish on a small piece of land that my father inherited that had been part of a land grant that my ancestors received from the Spanish Government, before the Louisiana Purchase. My family were strong supporters of Gov.Huey Long. I was born very poor with a brother and five sisters. My mother and father struggled to send us to school because of the high cost of school books. There finally came a time when they could no longer afford to buy books for 7 children. We children were told that we could no longer attend school. When you talk about politics in rural Louisiana, Huey Long’s name always comes up. He was a master communicator with the people in rural Louisiana. Some of the people who remember those meetings have told me that the clothes purchased and given to them by Huey Long was the first store-bought clothing they ever owned, since almost all children’s clothes were hand made from old flour sacks. Although Huey Long’s political accomplishments are well documented in books and chiseled in stone, less publicized is the difference he made in the lives of those he tried to help. We invite you to share your own stories about Huey Long to increase the understanding of his legacy. Did Huey have any influence on your life? Did someone in your family know him personally, hear him speak, join a Share Our Wealth club, or benefit from his programs? Whether testimonial or criticism, any independent information you choose to contribute will be greatly appreciated and may be posted here with your permission. I often have been disappointed with the way Huey has been portrayed by ill-informed people. Huey's legacy, so misunderstood by glib commenters and historians with axes to grind, is alive in Louisiana in the form of roads, hospitals and healthy, educated children. Huey Long, though certainly no saint, did more to help real, working people in Louisiana than anyone before or since, and his proposed Share Our Wealth program did as much to goose Franklin Roosevelt to real reforms as did people like Sen. Robert Wagner and Roosevelt's wife, Eleanor. No politician today manages to speak with such clarity, purpose and passion. Huey's policies are perhaps even more appropriate now than when he was alive, with wealth inequality continuing to be a problem in so many countries across the world today. It was therefore a great honour to finally make it to Baton Rouge to see his statue, appreciate and examine his legacy, as well as sadly see where he was tragically assassinated. 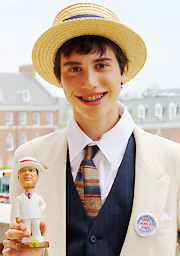 Jonah Weinstein, dressed as Huey Long, holds a Huey Long 'bobblehead' at the National History Day competition in College Park, MD, 2010. “I became acquainted with Huey Long through my National History Day project. The theme for 2010 was 'Innovation in History: Impact and Change', and I created an individual performance about Long's 'Share Our Wealth' program, a true innovation in history. Not only was Long innovative in his proposals to redistribute the wealth through social welfare programs, but also in the ways that he spoke directly to the masses. He spoke on issues they cared about in language they could understand. Long's speeches went straight to the heart of the bitter suffering of the Great Depression. People felt Huey Long was their friend, despite never meeting him. I am an American songwriter living near London. I recently awoke at 3 a.m. with the idea 'share the wealth'. I thought 'what a good idea' and got up to write it down. When further inspiration failed to materialize during the days that followed, I performed a search for it online and subsequently made a close acquaintance with Huey Long. After reading about what happened during his life, I remember being totally in awe of Huey Long and spending a day or two just reflecting on the things he'd achieved (and feeling very impressed and ever so slightly proud to be American). The wealth "all belongs to you … to YOU!" "Sure I carry a gun. Sometimes I carry four." "Can't tell when somebody's going to shoot the King!" black and white, they all gotta have a chance." © 2009 Cathy Wright, All Rights Reserved. Used with permission. “As a child growing up in New Orleans, Louisiana, I was always fascinated with history. Living in a state steeped in the history of oppressing my ancestors, I was moved when our Louisiana History class studied Huey P. Long. Huey Long’s belief and work to embrace “all men” is a timeless message that all Americans and humans can learn from. His basic premise that every man is a king and every man deserves at least a homestead was a message of justice. Imagine if we put into action just this basic belief. Just think, the homeless problem could be eradicated. “I'm sad to say that I was never able to see the likes of such a great man as Huey Long, but I have my own story to tell nonetheless. I am 19 years old, and I live in Alabama. Huey was a great man who looked out for the well being of this great Nation, and I believe this country could have done many great things if he would have been given a chance to be our president. I would do anything in my power to go back and meet him. I get so sad in my heart when I think about his death. His final words, "God do not let me die, I have so much to do" are just so touching to me. Here was a man who had such love for the people of America, and just when he was about to take it to the top, he was shot. “My mother was born and raised in Oak Ridge, LA. I was so inspired by reading the life and times of Mr. Huey Long! His message is one that we can use today. President Obama could use a page or two from Mr. Long's political platform of Share the Wealth as we are certainly in need of it. We are in the dawn of a new era for change yet we are still fighting backward and foolish political policies by those who only want to appease the wealthy. Our President has been trying to break through to those that don't want change. There is still a great divide between those that have and those that don't have. In addition our civil rights are being challenged and threatened by politicians whose interests have nothing to do with justice for the poor and middle class. I salute Mr. Long's life and legacy for his dedication as a voice for the voiceless. Thank you so much for providing a web page so that those such as myself, an African American woman whose descendants were share croppers but whose children eventually received an education in part due to the efforts of Mr. Long, directly or indirectly. We are to learn from our history so that we don't repeat it. It gives me great joy to read about a man that fought for true justice and equality. As Martin Luther King Jr., he was a drum major, a soldier fighting for justice providing light during a dark, traumatic, and trying time in American history.